Home / FREN 380, Jan-Apr 2019: What is Frenchness? FREN 380, Jan-Apr 2019: What is Frenchness? 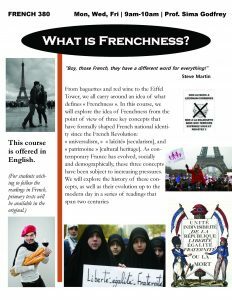 Dr. Sima Godfrey is offering a course that explores contemporary debates about Frenchness (FREN 380, January – April 2019). For more information, please find the poster in the link below. Please share with anyone who may be interested in registering for this course. Thanks!